Does it support brazillian portuguese (pt_BR) and the currency Reais (R$)? My customers live in Brazil and pay in Reais. How does the Stripe accounts brazillian transactions? In external currencies like US$ and then being converted in Reais (R$)? Could you explain how it works or not for Brazil? @Andre, currently Stripe does not support Brazil. They have started a private beta though which you could sign up and join. For more information on countries supported, see this page. @ kiduno, sounds like one of the files is missing. Did you download it from your dashboard? Please post this in our Stripe support forum so we can help you there. Thanks. Hi David, When will be available in the Philippines? Hi, am planning to purchase this plug in. I am currently located in the Philippines. Should it work if I will going to install this to my website? My target location are from US, UK, Canada, etc. By the way, I am using Vantage Theme on my website. @sanedman, it looks like Stripe isn’t available in the Philippines yet. You should sign up to get notified once it’s available. This plugin works fine with Classipress correct? I add this payment option in addition to my current payment options (Paypal, Bitcoin). WOuld this be a problem? @ websitemr yes, that is correct. FYI, We’re coming out with version 1.2.0 next week which includes several new features and fixes. You don’t need to wait since the upgrade will be free. We’ve just released a major update to this plugin (v1.2.0). It includes a lot of new features and fixes. See the “Changelog” tab on the Marketplace page for all the details. It’s sooo much better! If you’re an existing customer, you’ll need to manually download the plugin from your account dashboard (the Updater plugin won’t detect it). We had to change the plugin folder name from `stripe` to `appthemes-stripe` to prevent a naming collision with another unrelated Stripe plugin. Make sure to deactivate and delete your old Stripe plugin first. Then upload this new one. I have a classipress website with adsplash child theme. 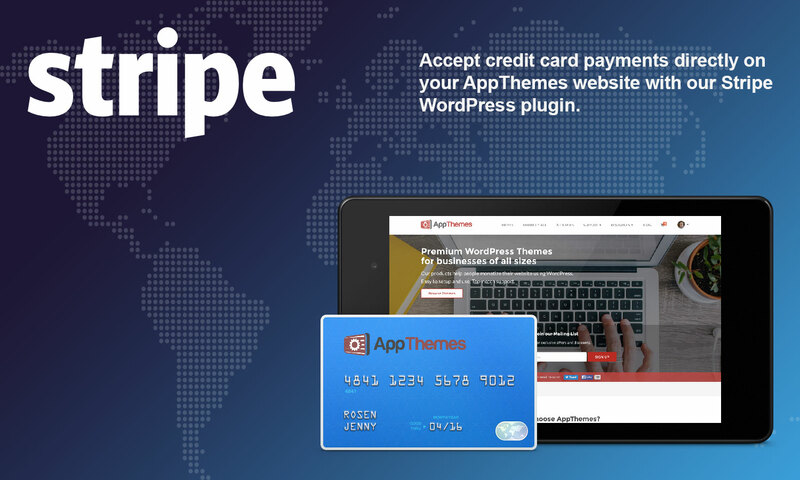 Will this plugin/payment system fully integrate with the classipress membership system? @Joe, yes it should work fine with ClassiPress. I haven’t tested it with AdSplash though but I’ll assume it works b/c it’s using the ClassiPress payment system. BlueHost and Stripe are denying accountability, so was hoping to get some help here. I posted this in the forum in an active thread with someone who reported the same issue. Doesn’t seem like anyone is cruising over there though, so though I would post here as well. Please help urgently. If you would like to use Stripe, the easiest solution for you will be changing BlueHost to something else… per what I have read, Stripe is not going to downgrade TLS to 1.0, and BlueHost is not going to upgrade TLS to 1.2 until 2018 (forcing those two companies to upgrade/downgrade TLS might not be successful). Thanks meloniq, but at the moment that’s not really a viable solution (hosting paid for a year up front), and especially since BlueHost is claiming they are already using TLS 1.2, it’s an option where I lose money. 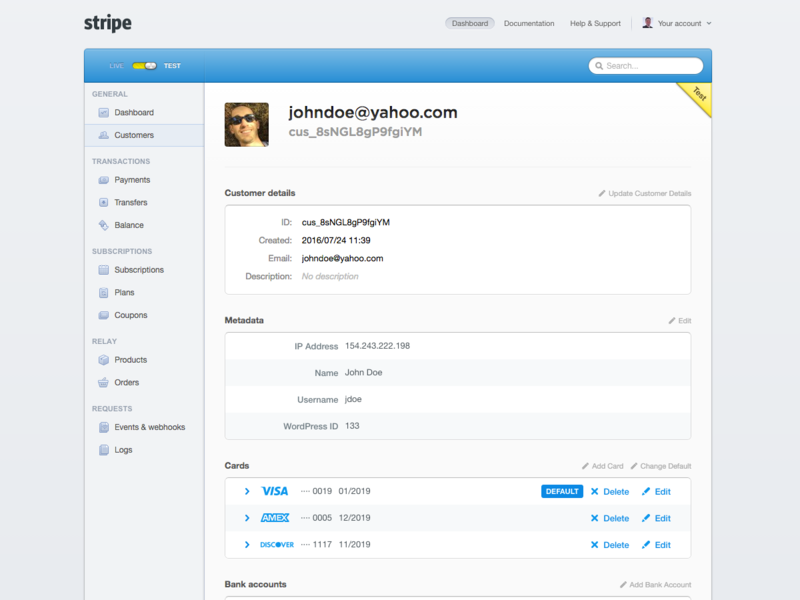 I would prefer if the plugin was updated to use the latest stripe php library 4.0.0 (a solution proposed by stripe, see my post in the forums: http://forums.appthemes.com/stripe/stripe-error-msg-api-requests-95543/). If this still doesn’t work, then I can start pointing the finger at BlueHost. OK, so I took a chance and did this myself. I replaced the lib folder under the theme directory with the latest stripe library (v4.4.0) and now it works fine. You guys need to update this plugin. @islandjobs, thanks for letting us know. We’ll get this fixed soon and release an update! We’ve just released version 1.3.0 which resolves the TLS bug and includes a handful of other changes. See the release notes tab for more details. If you’re a customer, make sure to download the latest version or upgrade from within your site (if you’re using our upgrader plugin). Hello i have a problem with the plugin, the option for the popup window is not working and when i klick the make payment button, it reloads only the page instread to open the credit cart popup of stripe. Please post your question in the Stripe support forum. Make sure to include the theme name and any screenshots to help us troubleshoot. Hi there, does this plugin works in Vantage 4.x? and is it available in Spanish? Hi, is there anyone responding to message here? Yes, it works with Vantage 4.0. 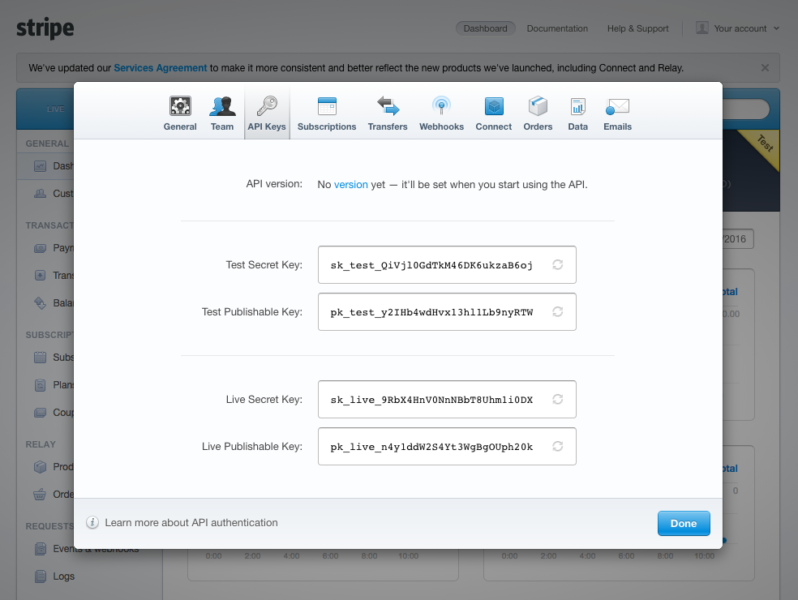 You can change most of the text directly inside WordPress admin. Hi there David. I just purchased this plugin and I’m a bit disappointed with what I got for $39. Hi Mike, all text is translatable. There are a few text strings available within the wp-admin Stripe options page, however you’ll need to translate and generate a .pot file in Spanish to translate the field labels. If you aren’t familiar with a .pot file, then it won’t be easy for you (no offense…there’s just a learning curve). That’s the case for any plugin and theme we sell. Some already have a language .pot file but most do not. 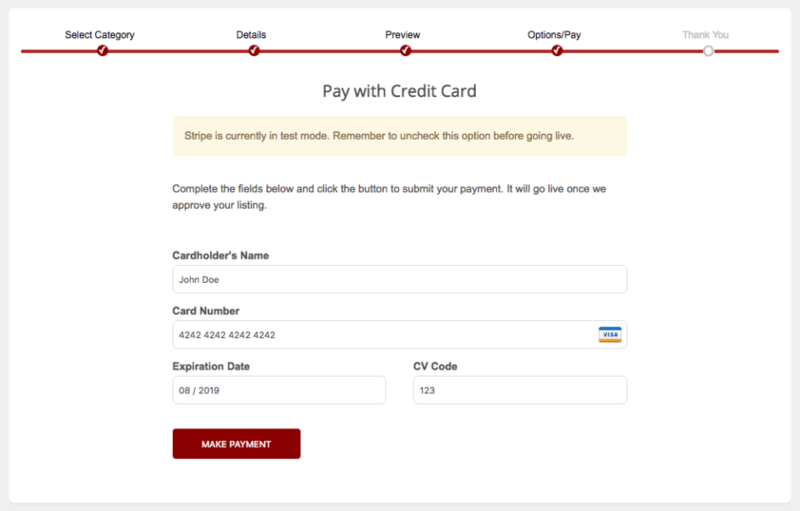 The other option is to use the Stripe modal window option instead of the embedded payment form. That will automatically translate the payment form into whatever language the visitor speaks. 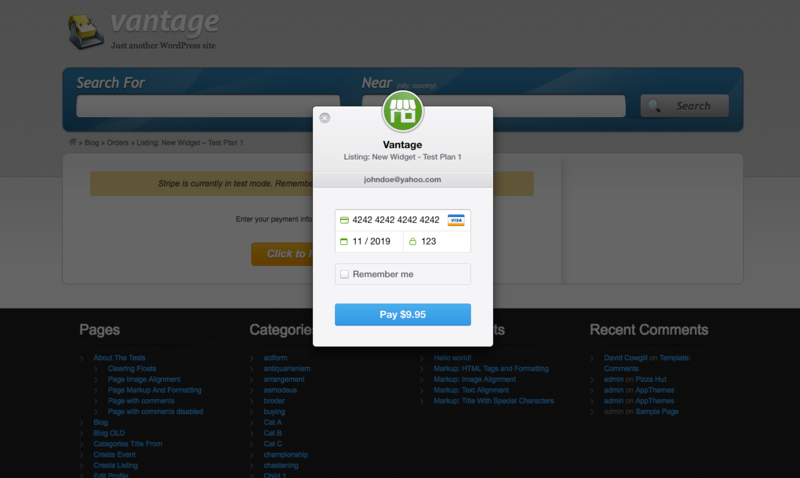 Re: return page – With Stripe, payment takes place directly on the page so there’s not “return page”. 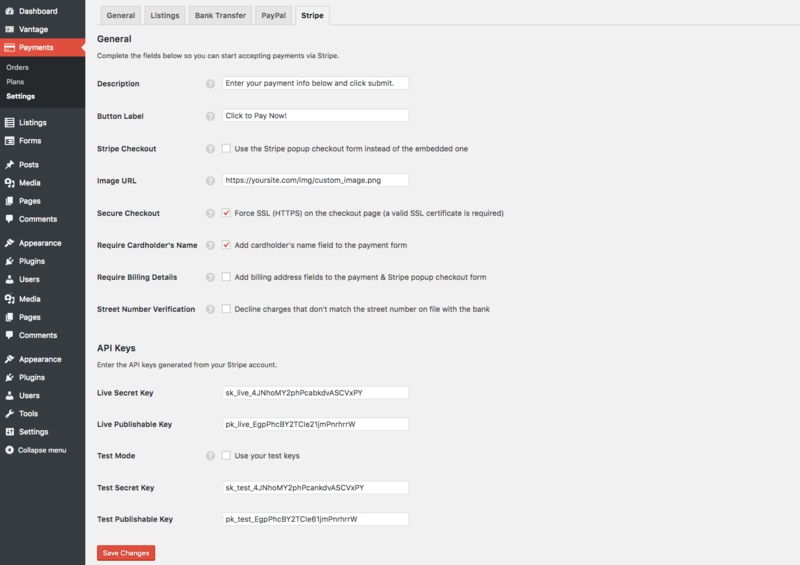 After someone clicks “Make Payment”, it will process and upon completion, show them a confirmation page. Re: Shortcodes – There are no shortcodes as payments need to take place on a certain page and order. Hi David, there are two reasons for me to purchased this plugin. One that it was compatible with Vantage 4.x and the other one (very important) that it was available in Spanish. If you can’t explain me how and prove it, I need a refund ASAP, so I can purchase what I need to deliver the site to my customer. Hi David, thanks for the response. I wish you would have told me the details before I purchased the plugin. The way I see it, I should get a refund or I might consider translating the .pot file if it not too large. Can you tell me where to get it and where to upload de .mo file when we are done. We’re not as quick to respond in the comments so please post your questions in our Stripe support forum instead. Someone will be able to explain how to translate it into your language there. To get you started, we highly recommend the Loco Translate plugin which allows you to easily translate the Stripe plugin text directly from wp-admin. Here’s a video tutorial on getting started. Here’s their official tutorial. It applies to a theme but works for plugins too. Hi David, how would I use this plugin to translate Vantage 4.x? As a follow-up, I just finished a tutorial that will explain exactly how to translate a WordPress plugin into any language. Check it out and let me know how it goes! Thank you David! Very useful. 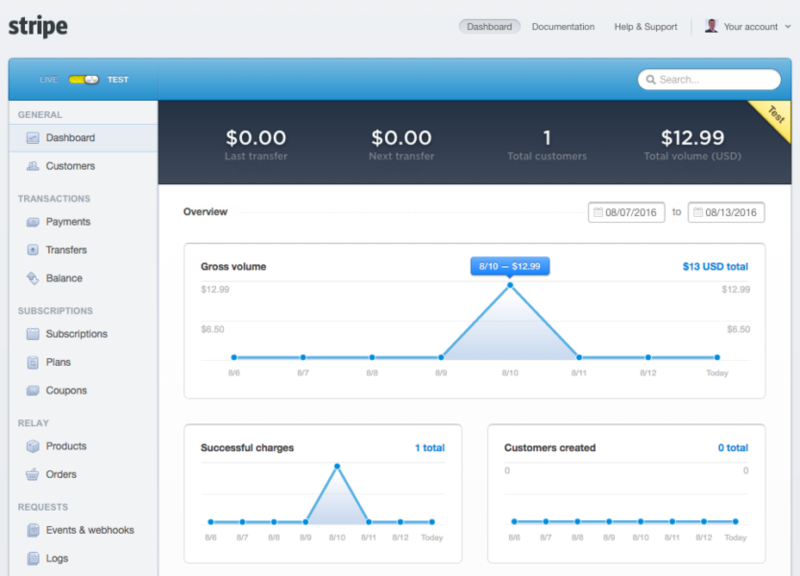 We’ve just released version 1.3.2 which resolves the Modal Window issue and prevents duplicated charges for single order. See the release notes tab for more details. Used this plugin for over a year. Some how the support is zero and have to rebuy it to get support. THIS PLUGIN IS THE ROOT CAUSE OF MY SITE TAKING 35 SECONDS TO LOAD. WTF. Once I disabled the plugin it loads in under 3 seconds …….im using 1.1.5…any support! I’ve responded to your forum thread. Please provide the info I requested so we can help troubleshoot your issue. Hi, please does Stripe work with the escrow system? I am Nigerian and want to charge my customers in our local currency. Do you think you can update the app to enable this feature in the plugin? Hi, $39 is a one-time fee? I downloaded the new updated version (1.3.3) but the folder is still stripe instead of appthemes_stripe like you mentioned. Do I need to rename the folder myself? Will this work with the newest version of Hirebee? I notice it hasn’t been updated in quite some time..
Hi @Justin, it should work with the latest version of Hirebee. Please let us know if you run into any issues. 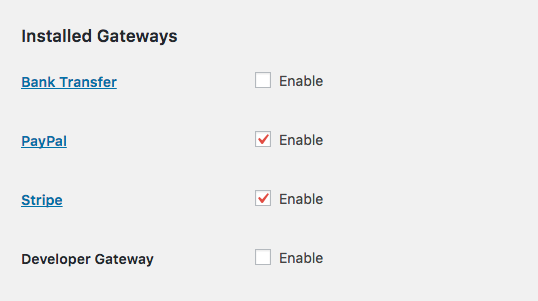 do we have to use THIS stripe plugin to get escrow functionality, or can we use ANY stripe gateway plugin.